Features five external pockets and main compartment. New in packaging NGT XPR Multi-Pocket Carryall. The new XPR carryall features five external pockets and main compartment. Padded handles and padded adjustable shoulder strap are as standard. Made from waterproofed 600D polyester with PVC backing. Approx size: 61 x 29 x 31 cm. 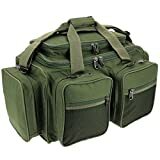 This entry was posted in Carp Rods and tagged Carp, carryall, COARSE, Fishing, Green, Tackle, Unisex. Bookmark the permalink.